When people think of Ohio, I can almost guarantee that they don’t think shoreline and islands. I guess that’s one of Ohio’s best kept secrets- though it’s not really a secret since we Buckeyes try to tell everyone how great Ohio really is. I know I try to do my part to convince people they need to come for a visit. One of my favorite places in the state is South Bass Island and the small, bustling island town of Put-in-Bay. More than 700,000 visitors explore the island each year and for the past three years, I’ve made visiting a priority. I just can’t pass up a chance to visit Put-in-Bay. I’ve visited with my family, my parents’ and this year, with my teen daughter and two of her friends. We made a day of it and we girls had a great time. To get to South Bass Island, we boarded the Miller Ferry in Port Clinton. I’ve ridden the Miller Ferry since I was a child so it only seems natural that I would return with my own family. It doesn’t hurt that they also offer the lowest fares to the island and free parking for the vehicles you leave on the mainland. If you choose, you can take your vehicle to the island as well. Miller Ferry will transport cars, trucks, bikes and motorcycles. While we were waiting to board, we watched a delivery truck drive off the ferry. From May until mid-September, ferries depart from Catawba every half hour beginning at 6:30 a.m. and head back at 7:00 p.m. with additional hours offered on the weekend. The girls were excited to board the ferry and sail off across the lake but, we made one mistake- we forgot that it is cooler on the lake with the breeze and we’d failed to pack sweatshirts or light jackets. We won’t forget next time. When we got off the ferry, we walked up the hill towards the Island Bike and Cart Rental building to pick up our island transportation. I’m sure there are times when you may find a full-size vehicle helpful on the island, but for most visitors, a golf cart or bikes are more convenient. Parking is limited and it’s a lot easier to get around with a golf cart. If you’re headed to the island with plans to stick to downtown Put-in-Bay, you may opt to ride the bus or take a taxi, as everything is easily walkable for most people. You’ll find both the bus and taxi at the top of the hill as you exit the ferry. We didn’t arrive until early afternoon and the girls and I were starving. Our first stop was to a fairly new restaurant, The Old Forge Cafe and Creperie. The restaurant opened last year and offers a unique dining experience. The building that was once a blacksmith shop, has undergone extensive renovations and the transformation is impressive. The space is amazing and the food…oh my goodness….just take my word for it and order the Crazy Sam savory crepe. My mouth waters just thinking about it. If you spend the night on the island, you may want to pop in to try the breakfast menu which I’ve heard is pretty incredible. I just can’t imagine anything better than what I ate for lunch. After we stuffed ourselves at The Old Forge, we decided we should try to work off some of that food, so we headed towards Perry’s Cave Fun Center. We could have played mini-golf, toured an antique car museum, climbed a rock wall, panned for gems, played laser tag, made our way through Fort Amazin’ or toured the cave, but the girls choose to head to The Butterfly House to browse in the gift shop and walk through the 4,000 square foot butterfly aviary. Visitors aren’t allowed to catch the butterflies but the girls really wanted one or more of the 800 butterflies in the room to land on them. They tried to coax the butterflies to land on them, but it just didn’t happen. When we’d had our fill of butterfly watching, we headed to The Chocolate Museum and to the cafe for some ice cream. We were surprised by the huge scoops! Even with the cooler temperatures, our ice cream was melting and dripping on us before we could finish our one scoop cone! The girls spent quite a bit of time shopping downtown in Put-in-Bay for sweatshirts since they were cold but the island has so much to offer; great restaurants, homes to tour, museums, monuments, a lighthouse, a stone beach, the state’s smallest state park, kayaking, the list goes on and on. We certainly didn’t have time to see and do everything in one afternoon. Besides, we really wanted to get out of town and sit and enjoy the shoreline. Before we headed back to the dock to catch our ferry back to the mainland, we stopped at Scheeff’s East Point Nature Preserve for a nature walk/photography workshop with Chloe from the Lake Erie Islands Chapter of the Black Swamp Conservancy. She walked us through the preserve to several beach areas, pointing out interesting flora and fauna along the way. The girls had their heart set on spotting a water snake on our walk and though Chloe tried to find one for us, we left without a sighting. We did however, get a few great pictures and I learned a lot more about the conservation efforts to ensure that natural areas on the island remain protected and preserved. Our day proved that not only is Put-in-Bay fun for the family and multigenerational trips, but it also makes a fun day out with teen girls! If only our day hadn’t gone by so quickly. Have you been to Put-in-Bay? What are you waiting for? 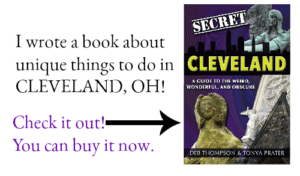 Looking for more things to do in Ohio? Check out my Ohio Bucket List for ideas. Definitely would rent a bike to tour all around the island, then find a place to relax along the shoreline and take in the beauty of Lake Erie! Would also like to get a Raspberry Basil Mojito at Goat Soup and Whiskey’s. The Butterfly House … My daughter loves butterflies! Summer’s winding down, and this is the perfect time of year to head over to the island. The kids have always wanted to go to the caves! Hope to win! Sight see and people watch first and then stop for lunch! I’ve never taken my kids or husband, this would be fun! 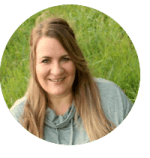 I loved visiting the Heineman Winery Tour and Crystal Cave on our last visit! The first thing I would do is take in the beautiful surroundings! Oh and find somewhere that has awesome food to try!! We would go ride the carousel and get ice cream! Love Put-in-Bay!!!! I love little, out of the way places like this (and the midwest is FULL of them!) Thanks for adding a new spot to my travel list! I’d love to take my daughter to the butterfly house. She is 2 years old and loves to see them. Would love to go! We have only been there once before. Ride our bikes around the island and sightsee! I am actually going there this weekend! I am looking forward to Mojito Bay! We would go bike riding first! For as many times as I have been to that part of Ohio, I have NEVER been to Put-in-bay. Sure would be a fun trip. I have lived in Ohio my entire life and have never been! Love PIB!.going next Monday and so looking forward go it!. Good luck all, thanks for the opportunity!!! I love Put-in-Bay it’s like being somewhere far away from Ohio life but it’s only a couple hours away! Visit the ice cream shop! I went here as a kid during one of the many (ever year) summer trips to Ohio to see our extended family! I’ve never visited but sure looks like a fun place! No better place to be on a warm, sunny day! I’d like to head to the Boardwalk for some lobster bisque! I have never been but it sounds like a great romantic weekend getaway spot! Want to check out everything there! We love lake Erie islands! Looks like a gorgeous location. I just love any chance to spend time at a butterfly garden. I had the chance to even visit one while visiting Malaysia. Thanks for sharing this hidden gem. This looks like a great place to visit with the family! The kids would love Perry’s Cave Fun Center and I would like to see Perry’s Monument. Put-In-Bay was my FAVORITE spot to be every summer when I was growing up!!! I have some of my best memories from that little island. My Dad owned a boat and we would literally live on it the week of my birthday and we’d head straight to Put-in-Bay Island. It is a beautiful place filled with loads of things to see and do and lots of good food. I’d LOVE to be able to take my kids there one day. In fact Thursday was Lighthouse Day and I thought about the lighthouse there. What a fun place to visit. And a great giveaway. We would like to play mini golf. Eats some yummy crepes at The Old Forge Cafe and Creperie! I have to admit that I never would have thought shoreline and islands. You really opened my eyes about the things to do in Ohio. Thanks! What a beautiful place! thanks for sharing.. butterfly aviary.. chocolate factory and all that lush green all around. I would love to visit! I was wanting to visit Ohio this summer, but never got that chance. Maybe next summer! My daughter’s been down there a couple of times and she says it’s lots of fun too. One day I’ll be able to check that out! My boss went there last year and loved it. I wish we lived closer to OH to make it a doable trip. I know if we head to the midwest, we’ll be taking a jaunt there! Add me to the list that didn’t know Ohio had such gorgeous shoreline! I never think of shorelines when I think of Ohio. I always forget that the Great Lakes dip into Ohio. Put-In Bay looks like a great place for the entire family! I have never been to Put-In-Bay so I think i’d like to ride around and check things out. Count me in for another who did not think shorelines when thinking of Ohio. Reminds me Presque Isle in PA! Sounds like a fun place. Oh wow, who knew Ohio was so cool! This is a place I think my family would enjoy. WOW I would want to just stay in the butterfly house!! I love butterflies! A CHOCOLATE museum?! I will have to talk my husband into a visit! Sounds like a great family vacation! I’ve never been, but you had me sold at Chocolate Museum. My daughter would love the butterflies though. Looks like there is a little something for everyone in the family. Last time I was at Put in Bay was for a babymoon when I was 7 months pregnant. Would be fun to go as a family. I’ve always wanted to check out Put n Bay and Ill be going back to that area next month. Hope to win! What a cute town. Would love to tour around by bike! This looks like a great place that you could spend a couple of days. We have never been but would love the chance. I would love to walk in that water and see the Nature Preserve! the four of us love riding bikes together, so that’s the first thing we would do….i can imagine how scenic and fun it would be! I’ve yet to go to Put-in-Bay, but I’ve always wanted to, so I would love to take my family there. We would probably want to have that authentic experience that riding bikes around the bay would offer. 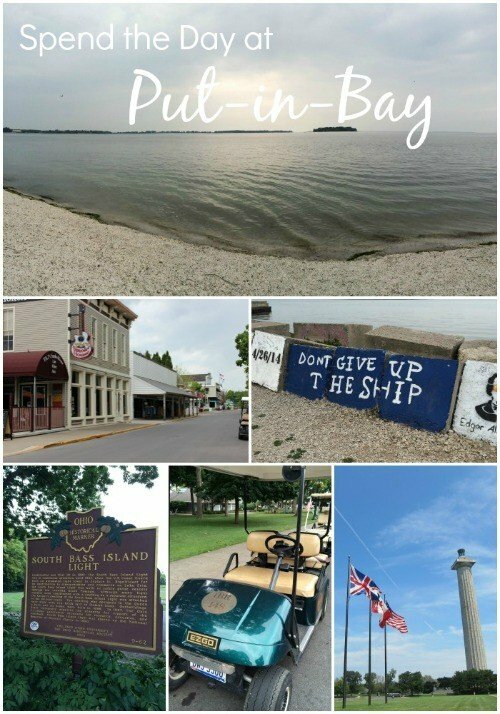 We have never been to Put-in- Bay, so I think we would want to jump on the bikes and ride around to get a feel of the area and see where everything is and some sites! “$3” taxi service. The GRAND Music is wonderful and I so want to try the pretzels at the Round House !